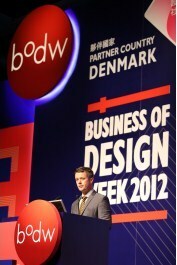 The Asian Design Community event of the year “Business of Design Week 2012” (BODW) is taking place from 3 to 8 December 2012. The BODW Forum began this morning at the Hong Kong Convention and Exhibition Centre in Wan Chai. The 3-day forum that will run from December 6 to 8, will explore the full scope of design, highlighting how businesses, society and culture can benefit from design. invaluable experiences and display some of their work. The BODW week will also see two Asian Design Awards ceremonies, which will be the culmination of a comprehensive and exciting design week. BODW is also marking the perfect end to Hong Kong Design Year. Since this year’s Business of Design Week partner country is Denmark, BODW Forum will host a number of influential Danish designers and design leaders. The Danes, known for their functional designs, will share their design culture, philosophies and experiences with the BODW audience. Danish designers are also leaders in social design and will therefore share how they improve the livelihood of Danish people through great design. The event will include Danish speakers such as Bang & Olufsen’s creative director, Johannes Torpe; Fritz Hansen’s president, Jacob Holm; founder and M.D. of Rosan Bosch Studio, Rosan Bosch; Chief Executive of Royal Copenhagen, Mads Ryder; and the founder of Kontrapunkt and creator of designs for companies like Carlsberg, Microsoft and Coca-Cola, graphic designer Bo Linnemann. In addition to the extraordinary Danish line up, BODW will also host a number of leading international designers: the creator of the Olympic Cauldron at the London 2012 Olympics opening ceremony Thomas Heatherwick; the Japanese architect and second ever female winner of the Pritzker Architecture Prize, Kazuyo Sejima; the creative director of the Japanese avant-garde advertising studio, PARTY Creative Lab, Masashi Kawamura; the founder of MAD Architects, Ma Yan-song; and the international design legend, Richard Sapper will all talk on the BODW stage. In addition, to the BODW Forum, on the evening of December 6th, the Hong Kong Convention and Exhibition Centre (HKCEC) will host the “Hong Kong Design Centre Awards Ceremony”. A number of awards will be handed out on the night to recognise young Asian designers, innovative design ideas and those who improve the quality of life in Asia. On the evening of December 7th, the HKCEC will also be the venue for the 10th anniversary of the GALA Awards dinner of the Hong Kong Design Centre. Close to a thousand guests and representatives from business, politics and design will gather to celebrate the recipients of the “Asian Design Lifetime Achievement Award”, “Meter Leadership Award” and “World Outstanding Chinese Designer Award”. The awards celebrate those who are committed to excellence in design and to improving Asian lifestyle. BODW is Asia’s leading annual event on design, innovation and branding. Since 2002, it has been organized by the Hong Kong Design Centre. Bringing the best of the global design world to Hong Kong, the week-long event encourages businesses to unleash the power of design by focusing on the vital relationship and complex interplay between design andbusiness.